It has been 4 years since I did my 3-part series on the problem with PUFA (Polyunsaturated Fats) that kicked off with The Common Enemy in Nutrition. Although I have altered my opinion on many things related to health and fitness, I still strongly believe that cooking oils are to be minimized for a better health outcome. I trimmed these charts from a larger one by Kevin Bass that I saw on Twitter this week. 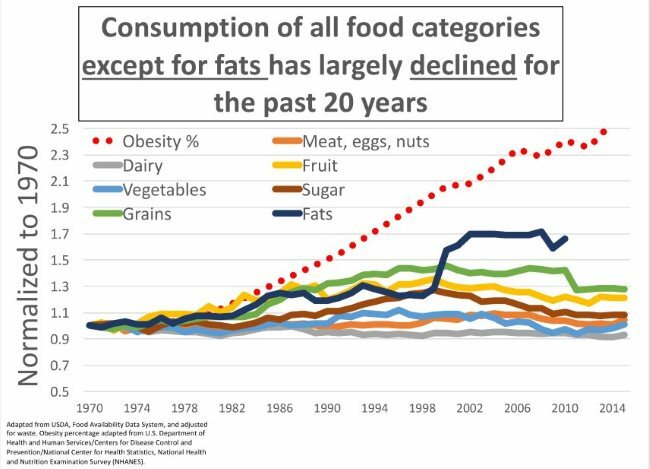 They outline the increase in fats and obesity in America since 1970. As I explained in the previous post Oh Noozs It’s Da EVIL Sugar Lobby!, it isn’t the sugar. In another tweet, Bass shows Americans are only consuming 34 more calories of sugar a day since 1970, whereas we are consuming 229 more calories of added fats and oils. The low-carb community loves to repeat the message that when Americans followed a low-fat diet they got heavier turns out to be false. During the supposedly low-fat era of the 1980s and 1990s, Americans increased their consumption of calories from fat. 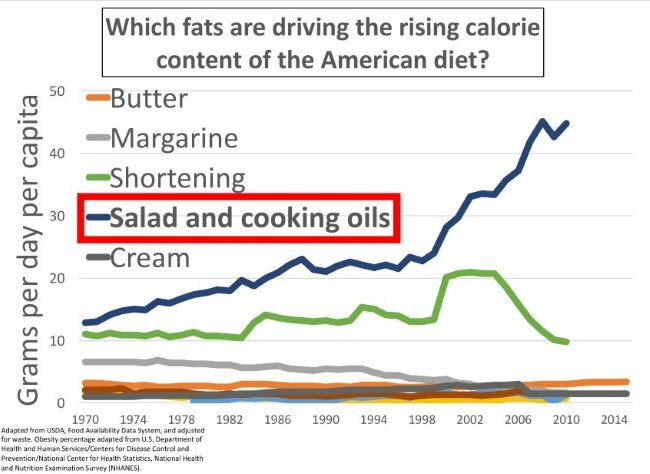 Then when the “low-fat era” ended, all brakes were off and fat calories spiked. And the nation got fatter. I see this spike in calories stemming from a shift in where we consume most of our meals. 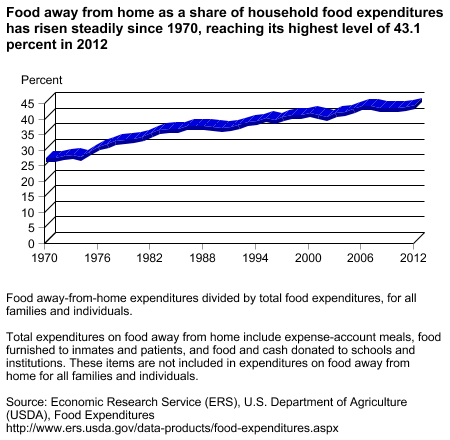 Look at the chart below, which tracks what percentage of our food we eat away from home. Doesn’t that line look a lot like the climbing obesity rate? Makes sense. When we go out to eat, we are often getting food cooked in cheap vegetable oils. High heat, fast cooking, and fried foods. Then to feel better, we order a Diet Coke, because SUGAR IS EVIL. Oh NOOZS! Forget all the Omega-6 math. Just follow my Peasant Diet. Eat at home cheaply prepared meals that require no cooking oils. Almost all my meals are cooked in liquid or in a pressure cooker. No oils needed. Stay away from restaurants as much as you can. When you do go, think about how the food will be prepared and order the option that doesn’t use cooking oils. You’ll not only lean out but you’ll also save money. Winning! Previous Oh Noozs It’s Da EVIL Sugar Lobby! are you boiling all meat/fish in liquids or steam? Like making soup? I am not really afraid of ghee, lard, butter and olive oil. Just be sensible. @Roland – I probably should add that I also use the oven to cook things like chicken breasts or turkey meatloaf. And since cooking in the oven requires less fat, I’m better off than the quick high heat stovetop cooking. I’m not afraid of the ghee or butter either, but I’m now approaching this decision via math. If I want to maintain or even reduce my current weight and I live in a hyper-caloric environment, I need to create as many wins as possible, because I know that I can’t win every battle of willpower with so many food choices available to me. If I were a farmhand in 1950 – pass the butter, but since I sit at a desk in 2017, I limit even the saturated fats. Not because I deem them unhealthy – I don’t – but because with fat the calories can be easy to overconsume. If my primary health goal changed and I needed more calories, I’d increase those sat-fats. Great to see you are back. I’ve been following your blog off and on for the last five years. Have you thought registering your site with brave payments? I see you already are accepting bitcoin donations. Would love to send you some BAT tokens as appreciation for all the great content over the years. @Mike – Yeah, I put the BitCoin thing there JIC. To date, I have not received a single penny either on this blog or my coffee site (which is 5x as popular). I had not heard of Brave, but I just signed up for this domain. Thank you! What are your thoughts on this website? I just came across it the other day and I’m not sure about making a fourth macro but the distinction of boiled starched vs. baked/fried is helpful and your peasant diet uses a lot of boiled starches. @Michelle – I had trouble following that article and have no way of knowing if it is accurate or relevant to me. I’d ask Tim Steele of the Potato Hack site. If he has an opinion, I’d like to read thoughts. Thanks. I found one of the author’s has written a book as well. I’ll reach out to Tim Steele.